Surfers in Arpoador. Photo by Andreas Lönngren. To say that sports in Rio is popular is an understatement; Football, beach volley, running, Jiu-jitsu, surfing, climbing and lots more is practiced all over the place. On the beach, in the gyms, in the mountains; it’s everywhere. But how can you practice these sports? On this page is some general info, clicking on the links takes you to the specific information about that particular sport or activity. Why the Huge Interest for Sports in Rio? Why are so many into sports here? Well to begin with there are almost perfect conditions. Good weather, ocean, wind, mountains; All this makes for perfect circumstances. The very strong beach culture where your body is often exposed is for sure a big inspiration to put in a few more sit-ups. The Carioca is also very playful by nature, chasing a ball down the beach or catching a perfect wave is what many live for. Catching waves on boards is something that fits the Carioca spirit like hand-in-glove. 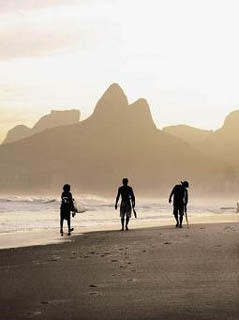 Surfing is one of the fastest growing sports in Rio de Janeiro. The topic is so large I have dealt with in a separate section over several pages, to get there just click this link. The same goes for Climbing and Hiking in Rio, just click the link and you will get access to valuable info on trails and wjat options are out there. Do you Want More Detailed Info on Sports in Rio?